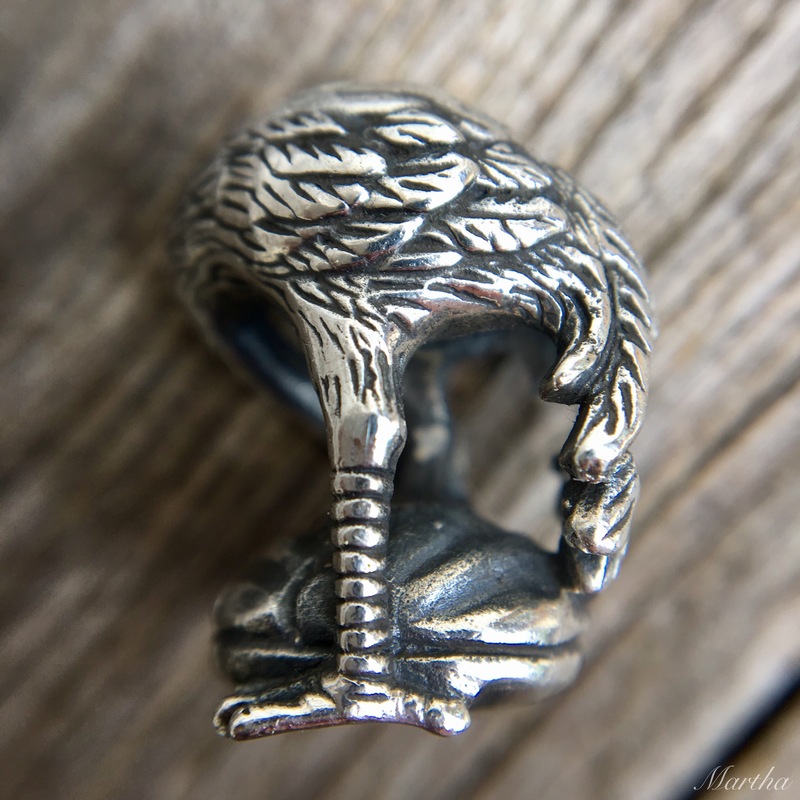 The Graceful Crane silver charm from Redbalifrog ($33 USD) is so elegant. I was actually quite shocked at how beautiful it is in person! 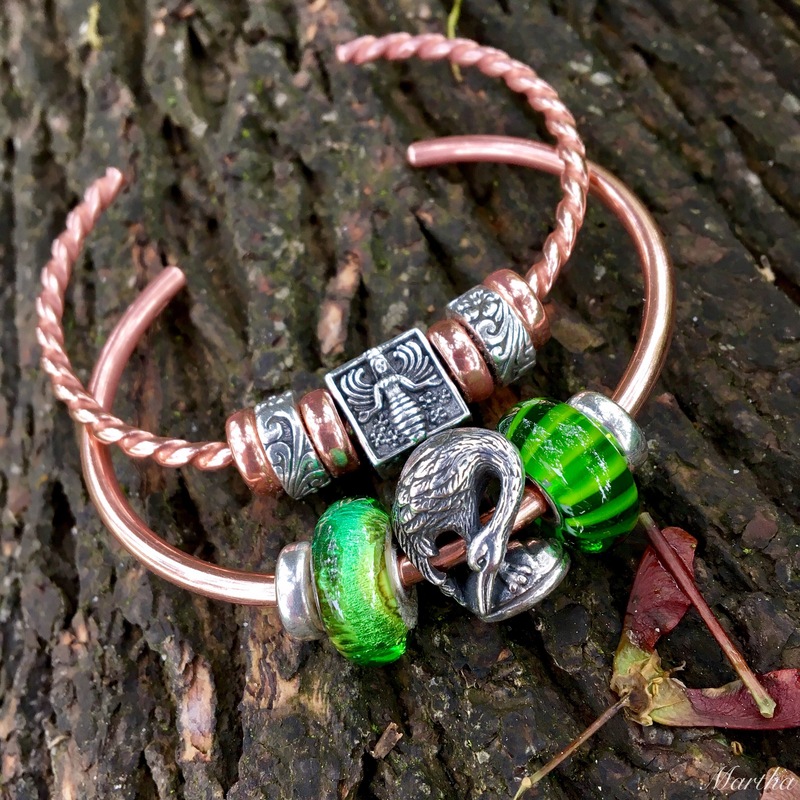 On the bangle below the stoppers are the Redbalifrog Hawaiian Floral ones and the green Trollbead on the left is called Earth and on the right is a Unique. Check out the back of the Graceful Crane. I love the details of the feathers. And look at the bottom of the foot! The Bee Goddess ($37 USD) is a square shape, which makes for a great focal point. The back and front are the same. The bottom, top and sides have some adorable bees! 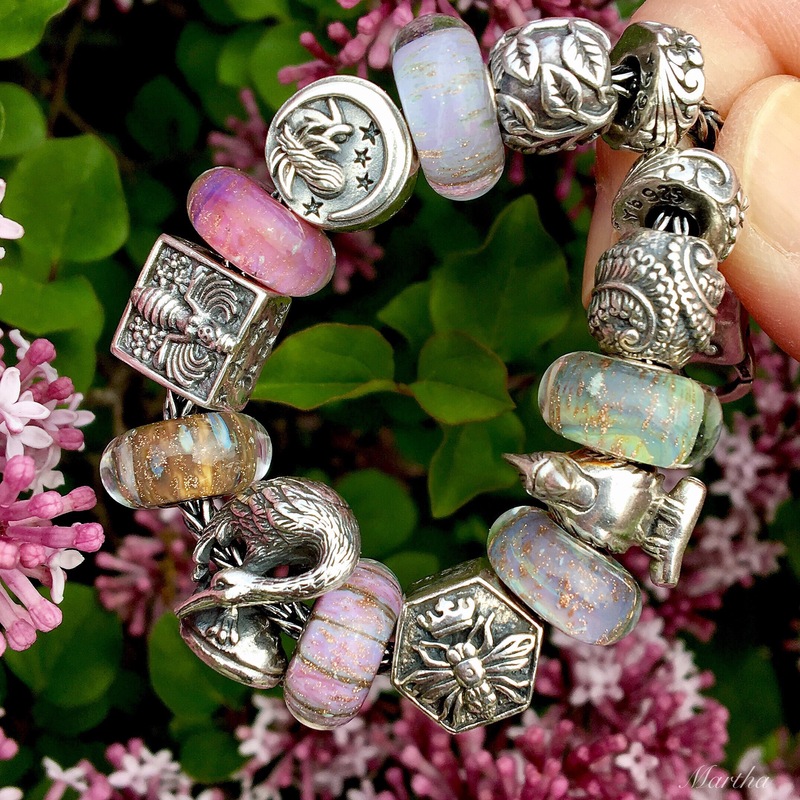 Here are Graceful Crane and Bee Goddess together on a bigger bracelet. 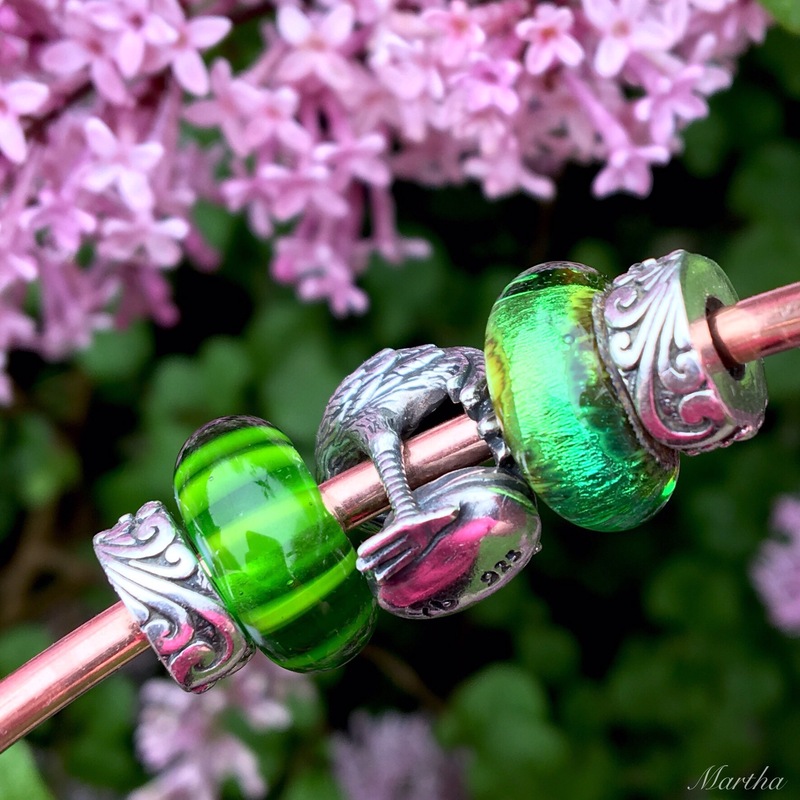 All silver is by Redbalifrog and all glass is by Trollbeads. Below left to right are Hawaiian Floral Stopper, Tree of Life, Graceful Sky, Phoebe the Moon, Pink Desert, Bee Goddess and Magical Lamp. Below left to right after Magical Lamp are Graceful Crane, Pink Conch, Queen Bee and Blue Desert. Below left to right after the Blue Desert are Cardinal, Rainbow Bridge, Fern Life and Hawaiian Floral Stopper. I made up a combo using the Brown Leather Strap. On the leather strap are Bonsai Tree, Surya the Sun and Lotus Flower. And for Suzanne, as promised, here is a video to show how the beads stay in place on the leather strap. I only ever put Redbalifrog beads on mine, I must say. I’ve had a black one for a couple of years and often put the Calla Lily bead on it. Ok, that’s it for today! Hope you’ve enjoyed this look at the Graceful Crane and Bee Goddess! 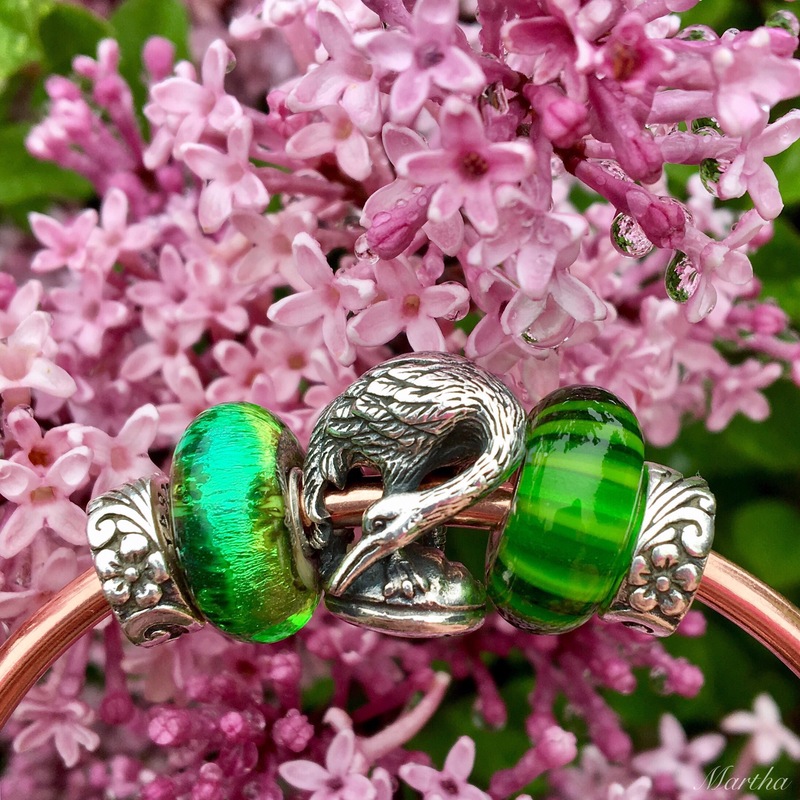 Do you have any nature themed bracelets or beads that you love? 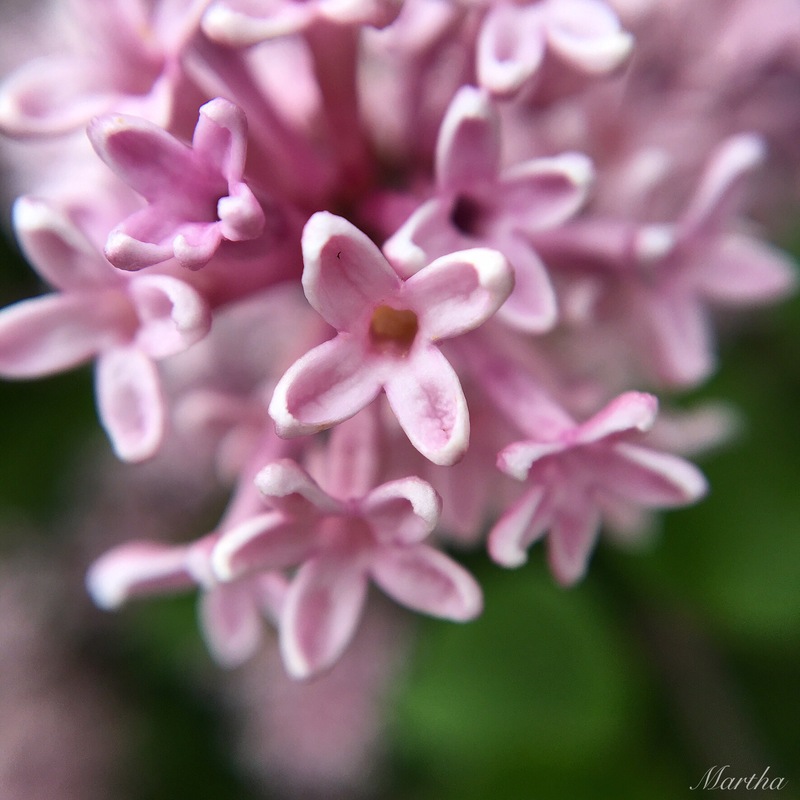 Hi Martha, Thank you so much for the video. There’s no question in my mind now that the beads stay in place! I really liked how the leather strap looked with just the Lotus bead on it, but now I see it with the three beads and that looks really good too. The Graceful Crane is so pretty! And I’ve got to get the Bee Goddess and Phoebe the Moon. I’ve become somewhat obsessed with the Redbalifrog stoppers right now. 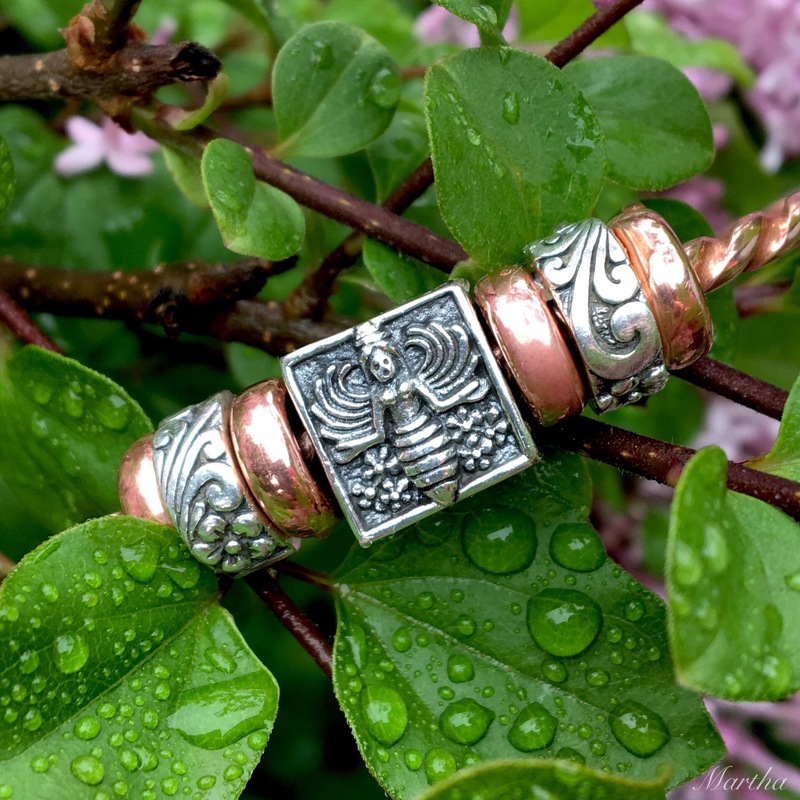 It seems a little silly but I have never cared for the fact that the rubber piece shows on the Trollbeads silver ones that I have. As I mentioned yesterday, you can’t see that on the Frangipani stoppers and it doesn’t look like it shows on the Hawaiian Floral stoppers either. I don’t have very many Redbalifrog beads and I really don’t know why. I was just thinking in the same vein, Suzanne! I don’t have any RBF pieces yet and I have no idea why not. Hi Suzanne! Yes, those beads don’t move around on the leather strap. 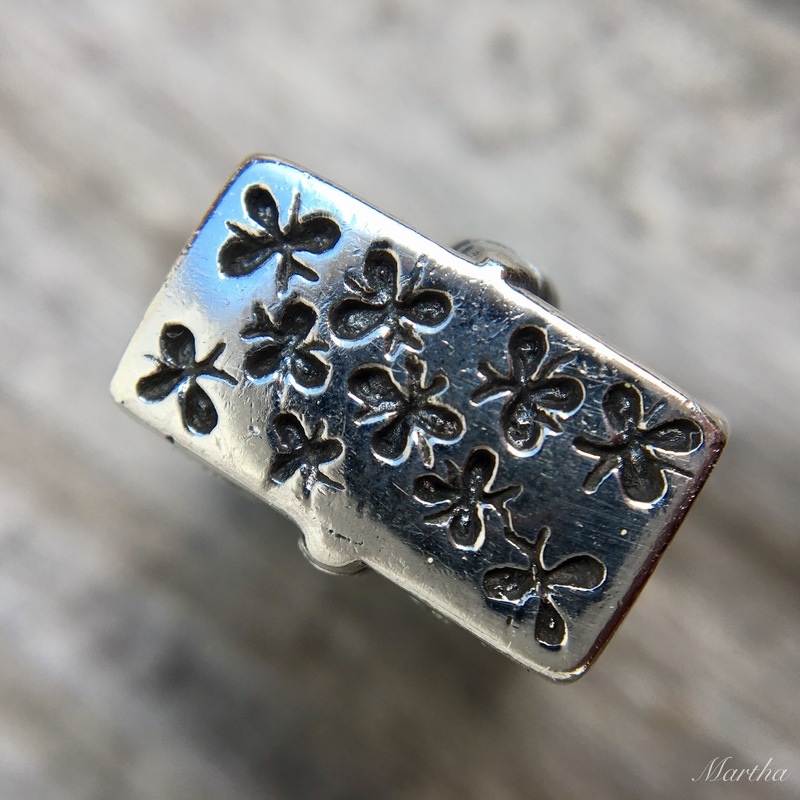 The Sunflowers charm one also looks really good on them. I think Redbalifrog has been a kind of word of mouth brand, unlike ones that have big advertising budgets. Every time I show things like the Pomegranate on Instagram people go crazy for it and ask what brand it is. You really can’t beat the quality of beads you are getting for the price, also. There is a lot of silver in these and they are pretty hefty! I’m in love with your flowers and bracelet photos. While I don’t have any RBF beads yet, I’ve put the Graceful Crane on my wishlist. Your detail shots of how the tail feathers meet the bracelet chain and the fact that it doesn’t spin around like some naughty beads makes it a must-have for me. Thanks Martha! I can’t wait to see what is in your beadmail! They really are beads to be enjoyed with a little time for each one, I totally agree. Hope you are having a good day, Sarah! Martha, I have got to stop looking at your Instagram posts! ( not really!) In the latest photo your friend is wearing a bracelet that I am loving!!! 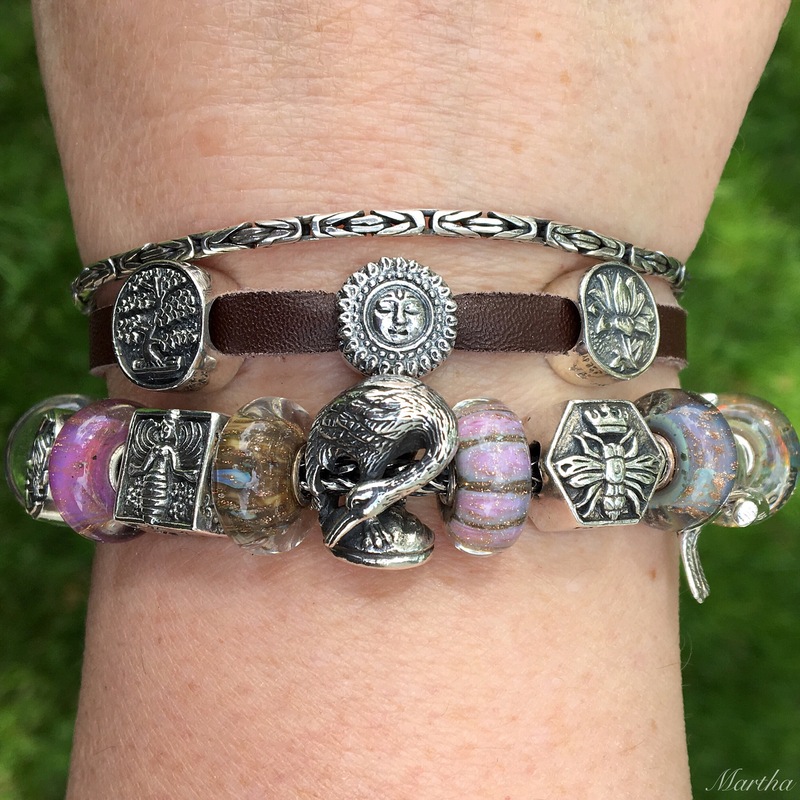 I figured out that it’s called a Sweetie Bracelet and it’s from Links of London. What I can’t figure out is if they are all seperate pieces that you put on it or is it already like that? Oh! Yes, that is such a fabulous bracelet! It is all one piece, but I think you can add some pieces that dangle? Cheryl and my friend Trisha each have one and they just wear them as is. Check out the Links of London website for sure! Hi Emme! Yeah, the button style charms are just perfect on the leather straps. Thanks for reading!